Ruins, reconstruction, demolition of old buildings, occupied houses, urban renewal, gentrification, new forms of protest. Everything tip-top, Kreuzberg? A question of perspective, as the changes since 2002 are impressive to say the least: the consequences of neoliberal urban development policies, winners and losers, droves of tourists, event-culture, and outrage. 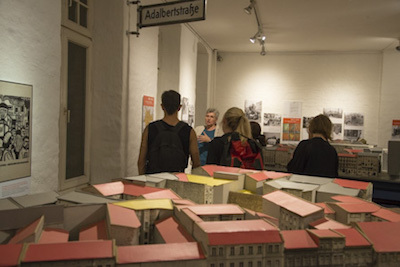 Our participatory permanent exhibit was conceived and realized from 2001 to 2003 by over 60 Kreuzberg residents from all different backgrounds and walks of life. One decade later only and Kreuzberg had been transformed. In response, the FHXB Museum expanded its material, reworked the exhibit, and made it accessible in both German and English. 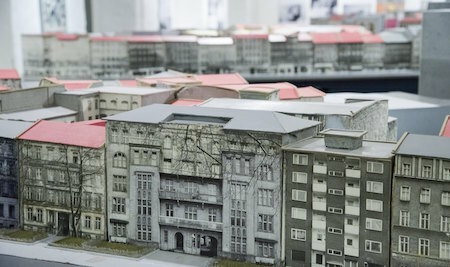 In a second step toward renewing and updating the exhibit, the Kreuzberg model-city is now filled with new content, brought into conversation with contemporary questions of “glocality” – the impact of global processes on the local level. Do you have any objects, photos or documents that might be interesting for our exhibition? Please contact us! The exhibit "local chats" came about in 2012 as part of a participative project with residents of Friedrichshain-Kreuzberg. Until 2017, it was shown on two floors of the museum. In 2016, the exhibit "distant conversations" was added. "local histories" demonstrates that a city’s history is also always a history of migration, making the importance of migration to a city and its many places visible. 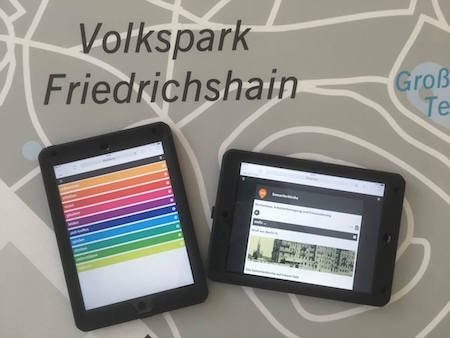 With a digital relaunch, organized by the museum together with the Berlin company "shoutr labs", portions of the "local histories" exhibit can now be experienced digital. Using one's own smartphone or one of the museum’s devices available to the public, visitors can explore the history of different sites and places within the district upon a virtual map, as presented from the perspective of local residents and newcomers (refugees/migrants). In the "local histories" section of this site, you are free to learn more about the history of Karl-Marx-Allee, Oberbaum City, Samariter Church, Mariannenplatz, the clinic Am Urban, and Görlitzer Park. In the section "local chats", residents of Kreuzberg and Friedrichshain trace their personal paths to various sites throughout the district – places embedded in their memories, places they find typical of the area, or places where they have experienced something special. Follow one of ten thematic tours, switch to a person's individual tour, or type in the number of a specific place. In the section "distant conversations", new Berlin residents share their personal perspectives on the city. Over the course of several workshops, people from different countries collaborated with film and performance artists to create video collages about memory, protest, access, flight, doubt, and the process of arrival. Furhter information about this project can be accessed here. The Otto Schneider Book Press (Buchdruckerei Otto Schneider) at Ritterstraße 12–14 was the last traditional book press in what was formerly called the "export quarter" Ritterstraße. Founded in 1928 by Otto Schneider, the printshop was operated by his son Gerd until 2001. After the sale of the Ritterstraße building, the shop moved its historical printing machinery and letter cases full of rare texts into the basement of the Friedrichshain-Kreuzberg Museum. After Gerd Schneider’s death in 2012, the museum printshop took his name. Today, volunteers care for the machinery of the old printshop. 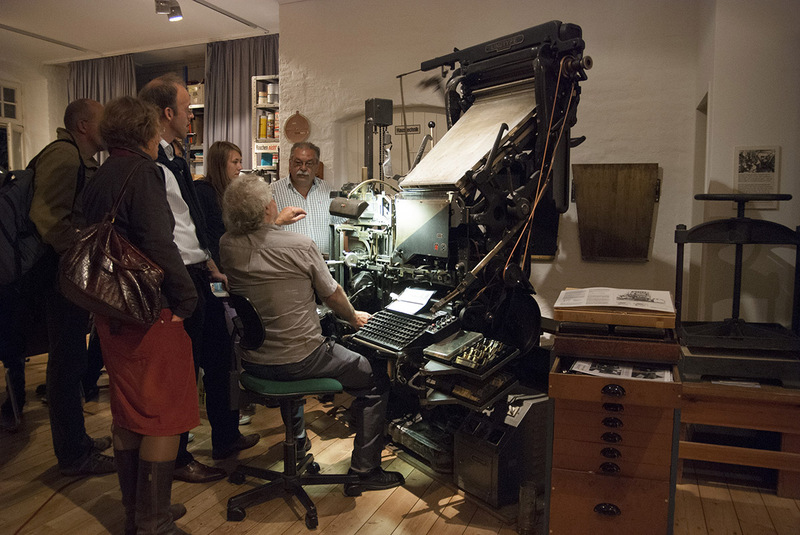 The printshop possesses a comprehensive/extensive collection of historical writing instruments, ornamentation, measurement objects, a “Heidelberger Tiegel” printing press, a Linotype machine, and an automatic "Frontex-Schnellpresse" machine. We want to preserve this unique testament to the long tradition of the Kreuzberg typography and printmaking trade, one of the last remnants of the legendary "newspaper quarter" that surrounded Kochstraße, Friedrichstraße, Markgrafenstraße, and Charlottenstraße, where Mosse, Scherl, and Ullstein once had their publishing houses. You can learn more about the historical “newspaper quarter” on the homepage of the Initiative Historisches Zeitungsviertel (Initiative on the historical newspaper quarter). In the museum printshop, printmaking and typesetting workshops for children and youth are offered during the day, with book-binding und printmaking courses offered for adults in the evenings and on weekends. Location: Friedrichshain-Kreuzberg Museum, free entrance, open: Tuesday–Freitag 12:00–18:00, Saturday–Sunday 10:00–18:00.